I belong to a teensy group of folks that have gathered from Canada and the US. It was decided that we would make blocks that will ultimately be joined into a wall hanging, for one of these friends, whose Mom just completed her earthly journey. The blocks were to be neutral and the favored color for stitching blue with other light touches (if any) of soft pastelles. I decided to just do a play on blue and this is how it came out. I hope that this will help bring warm, loving memories to Lauri as the days go by. My friend in Wyoming, Gail has give me this wonderful award. I am so touched. Thank you so much Gail! I have been slow in turning this around, but definately wanted to do so! 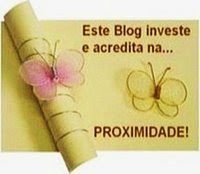 Here are the guidelines for this award:'This blog invests and believes in the PROXIMITY - nearness in space, time and relationships. These blogs are exceedingly charming. These kind bloggers' aim to find and be friends. They are not interested in prizes for self-aggrandizement! Our hope is that when the ribbons of these prizes are cut, even more friendships are propagated. Please give more attention to these writers! 'These are some very wonderful gals to visit. They are thoughtful, friendly and have so many wonderful ideas. I am supposed to pass this along to 5 people and here they are:). Lyn is an avid cq'er, new to the art and soooo very generous in spirit. I have NO idea how she does it all. She's a wonderful friend! Hideko , Jo , Kerry and Cathy are dear friends and co-owners/moderators of CQI! They are ALL soooo generous of spirit! Tis a blessing to work AND play with them! And.... Janet who shares so readily with her skill, humor and loving spirit! She is a treasure! I've gotten behind on posting/reading, etc. so I need to get meself caught up! LOL!! I've been tagged by Kerry and Connie for the 6 picture meme! This picture is one from the CQI retreat last year when we went to the art museum for a private showing of 5 crazy quilts! Most of them dated from 1800's and were just gorgeous! 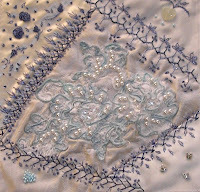 I really enjoyed looking at the stitching and the different motifs! 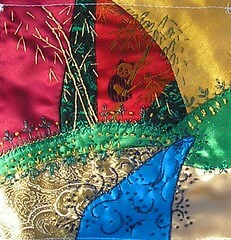 The colors are just so rich and this particular quilt was in very good shape. 1. Lou Anne is a veritable whiz with the needle and her knowledge of antique cq is awesome. She (to me) specializes in Redwork that is fabulous!!! Take a look at some of her great work! She's even started a recipe blog that have some fabulous ideas! 2. 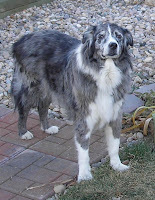 Gail's blogs show her progress in taming the wilds of Wyoming and her great traditional and cq work! 3. Next, is my friend Janet in my home state of Colorado. She has done preservation work on antique cq's and is another FONT of knowledge on the subject! I LOVE to sit and listen to her chat about them and her humor is fantastic! 4. 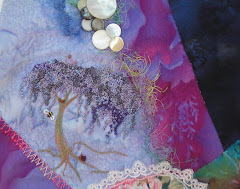 Susan has two blogs....one for her wonderful traditional quilts and the other for her cq!! She is such a generous, sweet person and shares her knowledge freely with newbies at CQ4Newbies. 5. Lauri is another friend in Colorado that does awesome fantasy stitching and beading! When she travel.... look out! She takes her stash seriously! LOL!!! She's organized to a fault and I LOVE seeing what she's going to conjure up!!! 6. Mary Frances is my bud from my local cq group, RMCQ! She runs her own biz, had TWO busy kiddos and still manages to find time to stitch! Take a look at some of her neat creations! So to pass on the fun! Here are the rules: Go to your Picture folder on your computer or wherever you store your pictures. Go to the 6th Folder, then pick the 6th picture in that folder. Post that picture on your blog and the story that goes along with the picture. Tag 6 other people that you know or don’t know to do the same thing and leave a comment on their blog or an e-mail letting them know you chose them. We are having gorgeous, unseasonably warm weather here in Colorado and our fur kids have always enjoyed the mountains so we had a short visit. Here Sukha (our golden) Boogie (far left) and Koda are checking things out. Sheeba has already gone exploring!!! 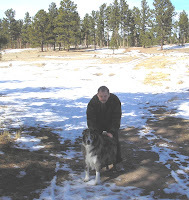 This being our first trip to the mountains with Koda he was absolutely in AWE of the huge back yard he had to run in with SUPER DUPER smells! LOL!! 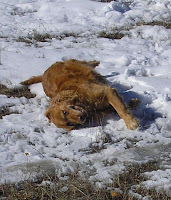 Here Sukha is doing her impersonation of a snow angel..... she was sweeping her legs and tail back and forth! LOL!!! And...here is Dad with Boogie! This trip was bitter sweet, as it is Boogies last. Almost three months ago, Boogie was diagnosed with cancer and thru medicine and extra loving care he's given us more time with him. He has started having more "bad" days so the only answer was to let him go play with his brother Chocolate that we helped over rainbow bridge a couple of years ago. Boogie is a treasure, leaves us wonderful memories. Til later, sweet one. YOU will be sorely missed! 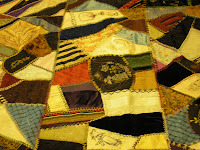 A special lady from the crazy quilt lists recently passed away from breast cancer. Kate in Chillicothe ask if anyone was interested in doing a block for a commemorative quilt... I did. This is it!!! Kate sent some fabrics and I added a couple of my own, left it just at embroidery to eliminate assembly problems and am sending it on its way. Enjoy!